After a hard day at the beach or a long commute home, everyone wants a quick and refreshing cool down. And if you’re hosting a backyard barbecue or beach party, providing a great summer beverage is a must. These refreshing summer coolers take full advantage of the season’s flavors, making use of fruits, juices and fresh herbs, wine, beer, or tea. Many add fizz from sparking wine or fine German sparkling mineral water, which is naturally carbonated and full of trace minerals. Among our mix you’ll find classic fruit-based drinks, wine spritzers, beer coolers, and trendy drinks, too. Some have alcohol, some don’t – and most can be converted to non-alcoholic with tricks like replacing champagne or sekt with sparkling mineral water. Take refuge from the peak of summer heat with these refreshing summer drink ideas from Germany! 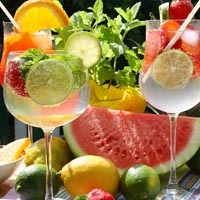 Wine or fruit juice combine with sparkling mineral water for a light summer refresher. Use whatever’s ripe and at the season’s peak, and this colorful fruit and wine punch will vary as the summer progresses. Neither Scottish nor lemonade, nevertheless this refreshing alcohol-free summer drink made from herbal tea and fruit juice is a joy on summer’s hottest days. Cold duck is a great drink for a summer party, served with seafood, poultry or salad. The original recipe from Germany uses white wine and champagne. A bubbly summer treat made with elderflower syrup, sparkling wine, and sparkling soda. Fresh homemade lemonade with a lovely pink color from German strawberry preserves and the bubbles of German sparkling water. A great tasting and healthy summer afternoon drink. This refreshing cooler made with German Hefeweizen (wheat beer), sparkling wine and raspberries. Make your own version of this extremely popular, refreshing drink! Fresh fruits and berries combine with dark German beer in this tasty punch, perfect for summertime entertaining. Fresh berries, a touch of citrus and German white and sparkling wines. This refreshing punch is sure to become the favorite treat for your spring picnic or your barbecue party.